One last breakfast on the terrace overlooking the sea. Goodbye Palazzo Senape de Pace. 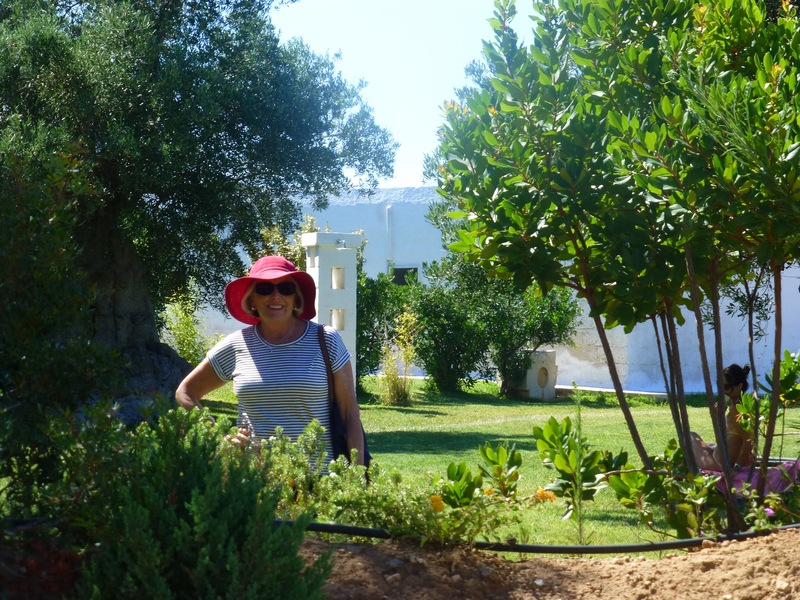 So along with my own ‘Dan Brown’ we headed off for Ostuni – the white hilltop town over looking the Adriatic Sea. It’s quite a big town and all roads lead up past beautiful gardens to the Cathedral at the top. 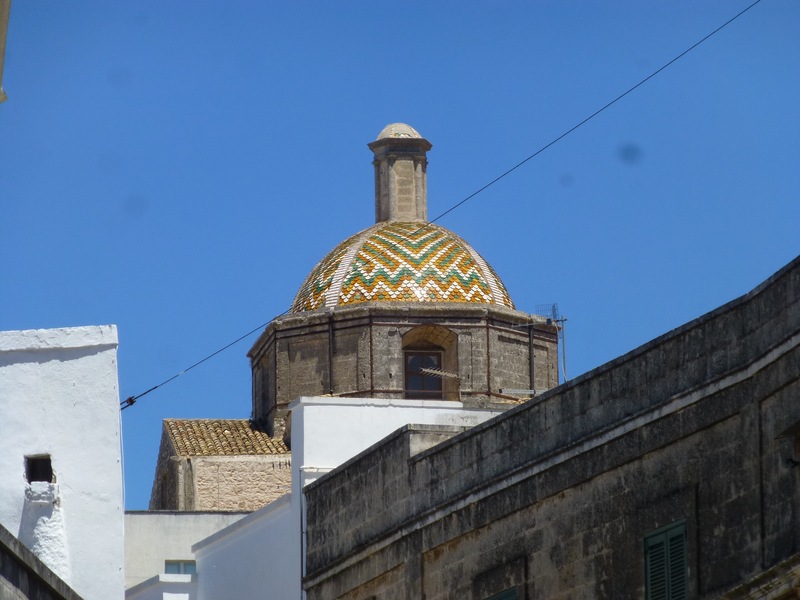 The mosaic dome on the cathedral can be seen from far away and the white washed houses shine in the sun. It’s interesting how different areas have different types of features. This one is bianco. 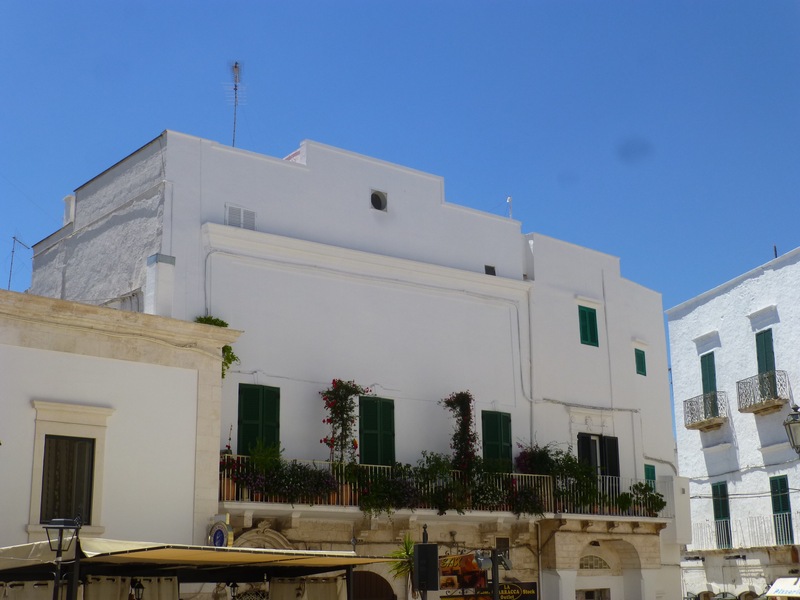 It’s not far from Alberobella where we started our Puglia journey. It was all white as well but with the pointy stone roofs. 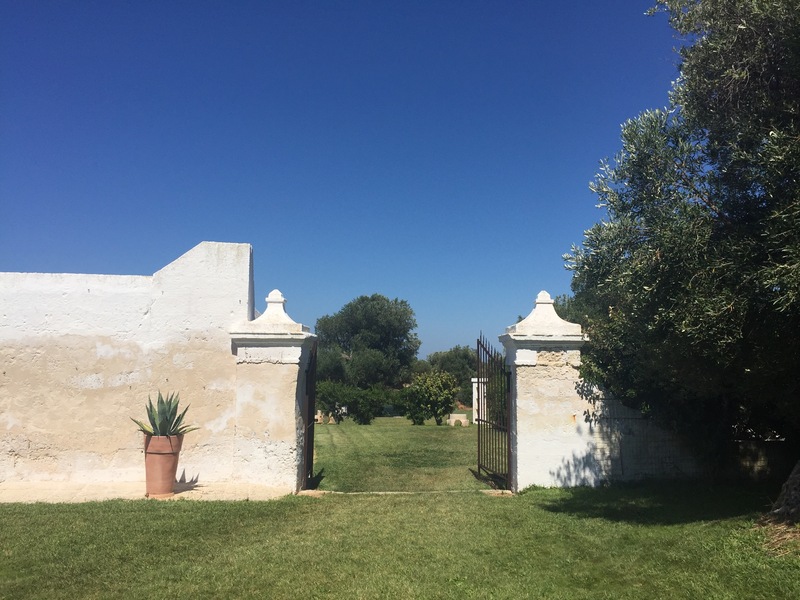 After lunch we head for our night’s accommodation, a Masseria – a farm stay. Or agritourismo as they are called up north. There are lots of them around here. They offer lovely accommodation often a ‘wellness centre’ and an evening meal. We heard about this one from friends and decided to try it. I’m so glad we did. Arrival at big iron gates set the tone. 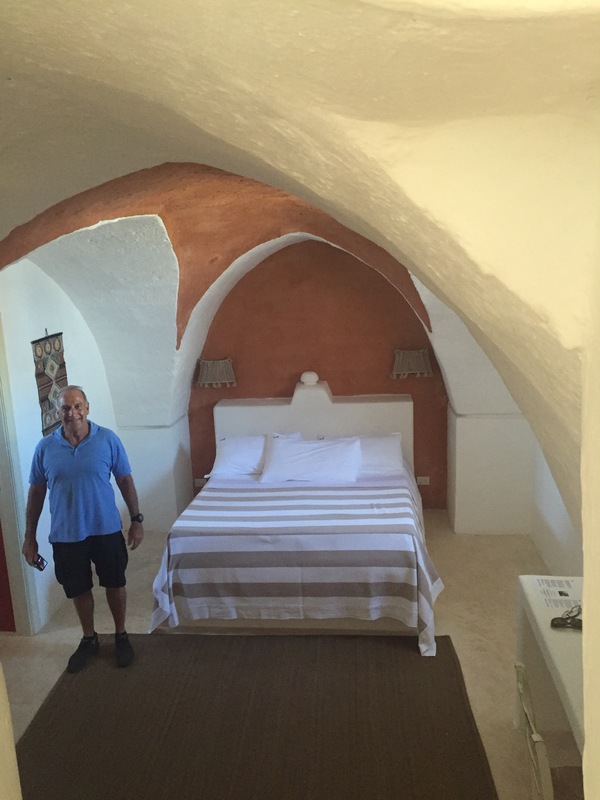 The white buildings are clustered farm style around a courtyard with a chapel, lovely gardens and a beautiful pool area. . Beautiful main rooms and lovely separate bedrooms. It’s charming and practical all at once. Steve likes the pillows and towels. they have SM embroidered on them! I’m sitting beside the lovely swimming pool listening to the different accents of the guests, some with children and one family with an Asian nanny. We’re looking forward to tonight’s meal. It sounds wonderful. 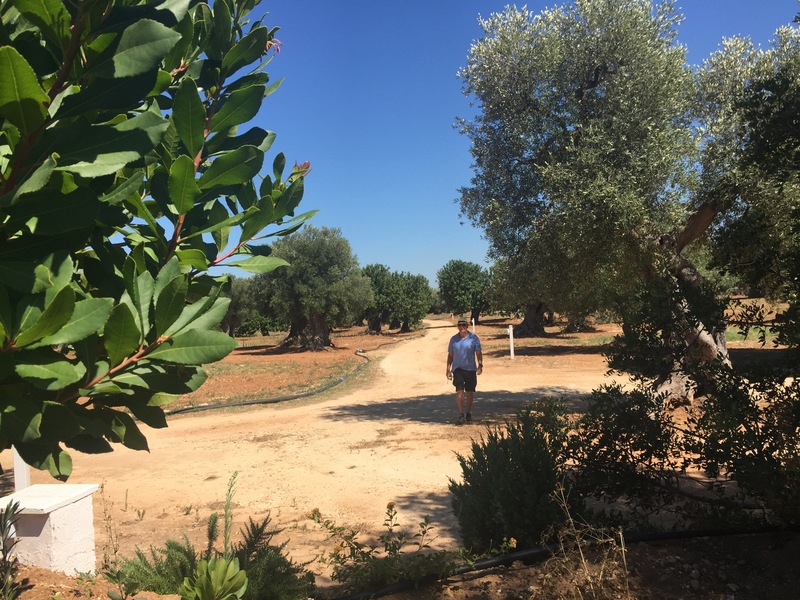 Before then a swim, a nap and walk in the olive groves. Sounds like another excellent accommodation choice Fran.